1. Preheat oven to 325 degrees F. Line two baking sheets with silicone baking mats and/or parchment paper (I use both). 2. In a medium bowl, whisk together the flour, cocoa, baking powder, baking soda and salt. Set aside. 3. In a medium saucepan set over the lowest possible heat, melt the butter and half the chocolate, stirring constantly. Set aside to cool slightly. 4. In the bowl of a stand mixer fitted with the paddle attachment, beat together the eggs, sugars, vanilla, rum and instant espresso. Add the butter-chocolate mixture and beat to combine. 5. With the mixer turned off, add the flour mixture and remaining chocolate all at once. Beat on low speed until just combined. Stop the mixer and scrape down the sides and bottom of the bowl with a spatula, folding the dough gently to ensure the liquids and flour are incorporated. - Sprinkle the cookies with flaked sea salt after the first 7 minutes of baking. - Add nuts and/or dried fruit, white or milk chocolate chips, caramel pieces, mint candies...whatever strikes your fancy. Just don't substitute white or milk chocolate for the melted chocolate. - Instead of rum, use a flavored liquor such as Chambord or Grand Marnier. - Avoid dark nonstick baking sheets, which absorb too much heat and cause the cookies to spread and brown on the bottoms to an undesirable degree. - Don't let the dough sit while you fuss around doing other things. 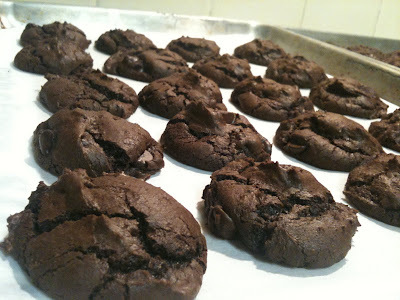 The melted chocolate will cool, causing the dough to become crumbly and the cookies to lose their smooth sheen when baked. - ALWAYS use fresh baking powder and soda, both of which generally keep for 6 months when stored in a cool, dry place. For vegan and gluten-free variations, click here. I love using rum in the baking. Do you think Amaranth or coconut flour would work instead? Do you have a brand of natural cocoa powder you recommend? Honestly: Hershey's! I don't recommend Trader Joe's -- it's bitter. I've used Valrhona, Green and Black's, etc., and Hershey's always wins.